Ventura, C.; Martos, M.; Giro, X.; Vilaplana, V.; Marques, F.
This work presents a browser that supports two strategies for video browsing: the navigation through visual hierarchies and the retrieval of similar images. The input videos are firstly processed by a keyframe extractor to reduce the temporal redundancy and decrease the number of elements to consider. These generated keyframes are hierarchically clustered with the Hierachical Cellular Tree (HCT) algorithm, an indexing technique that also allows the creation of data structures suitable for browsing. Different clustering criteria are available, in the current implementation, based on four MPEG-7 visual descriptors computed at the global scale. The navigation can directly drive the user to find the video timestamps that best match the query or to a keyframe which is globally similar in visual terms to the query. In the latter case, a visual search engine is also available to find other similar keyframes, based as well on MPEG-7 visual descriptors. Ventura, C. [et al.]. 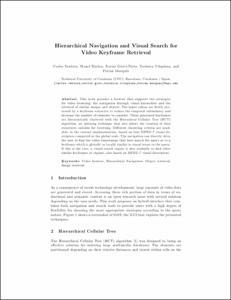 Hierarchical navigation and visual search for video keyframe retrieval. A: International Conference on MultiMedia Modeling. "Advances in Multimedia Modeling, Proceedings of the 18th International Conference, MMM 2012". Klagenfurt: Springer Verlag, 2012, p. 652-654.